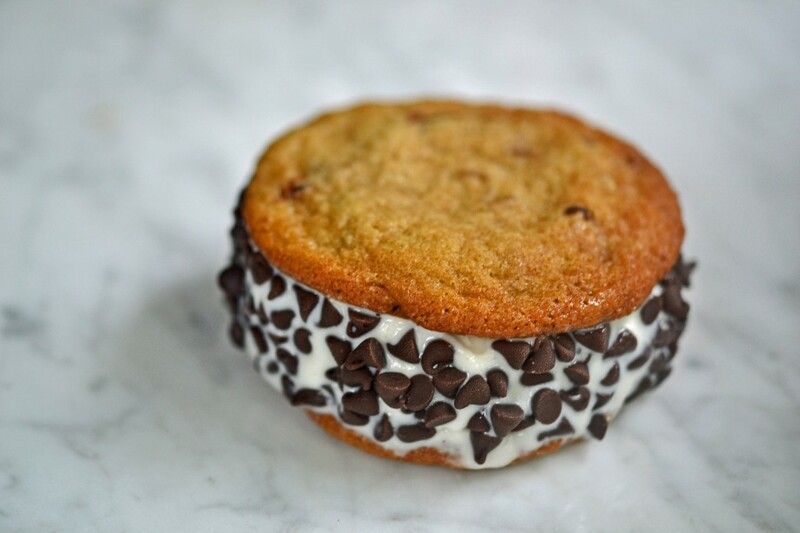 GF Chipwich: Gluten Free Chocolate Chip Ice Cream Sandwiches | Great gluten free recipes for every occasion. Welcome back to D.I.Y. Fridays, an occasional blog series where we D.I.Y. a basic (sometimes naturally gluten free) recipe (like today’s recipe for gluten free chocolate chip ice cream sandwiches) or other ingredient that you otherwise might be inclined to buy. If you remember the Chipwich chocolate chip ice cream sandwich and wondered where it’s been, this copycat recipe is for you. Okay, if you even like ice cream, this recipe’s for you. But if you’ve ever had the experience of standing beside the ice cream truck with your gluten free kid, googling everything on the menu to see what’s gluten free while he watches you expectantly, today’s recipe is especially for you. Because almost nothing in that truck is gonna work for my gluten free son, and I make it okay by promising him I’ll D.I.Y. something for him that’s even better. Luckily, that’s a promise I can easily keep. Maybe Classic Snacks should have had an ice cream chapter! No worries, though. We’ll make that right, right here on the blog, one recipe at a time. Today’s recipe is a bit different than recipes past, because not only can’t you buy a gluten free Chipwich, but you can’t buy any Chipwich. They stopped making this, the absolute perfect ice cream sandwich, in 2009—but I didn’t even notice, since my son started eating (and I started baking) gluten free in 2004. To complicate matters further, I first posted this recipe for thin and chewy gluten free chocolate chip cookies in 2012, which was already 3 years too late—or 8 years too late depending upon your perspective on this whole Chipwich business. Still with me? The point is this: If you’re hoping for the perfect ice cream sandwich, you’ll need to make your own. And I’m here to tell you how to get it done. Making an ice cream sandwich might seem like the simplest thing in the world. And I’ll be honest—it’s really not too complicated, as long as you have the right ingredients at the right temperatures. And it all starts with the right thin and chewy cookie. Try to make an ice cream sandwich with a too-thick cookie, or a crunchy cookie and things won’t go your way. There are a few tips and tricks to getting these gluten free chocolate chip ice cream sandwiches to have that gorgeous smooth and professional edge, and they’re all detailed in the recipe instructions below—whether you’re using homemade vanilla ice cream or store-bought pints of vanilla. The simple pleasure of an ice cream sandwich in warmer weather is, of course, undeniable. And when your gluten free kid can have almost nothing from the ice cream truck other than, say, a frozen fruit bar, sometimes your heart is going to break for him. This is how you mend your broken heart—and his. Now since I’m not one to deny my past, checkered as it is, here’s a photo from when the recipe for these thin and chewy CCCs post was originally published in 2012—almost 3 years to the day. Not terrible, right? First, if using homemade ice cream, make and freeze the ice cream according to the recipe instructions. Transfer the ice cream to the center of a large sheet of unbleached parchment paper and, working quickly, smooth and roll into a cylinder about 5-inches in diameter. Wrap the ice cream tightly, place on a flat surface like a small cutting board or a plate and place in the freezer until completely firm once more (about 1 hour). Make the cookie dough. Preheat your oven to 325° F. Line rimmed baking sheets with unbleached parchment paper and set them aside. In a large bowl, place the flour, xanthan gum, baking soda, salt, and granulated sugar, and whisk to combine well. Add the brown sugar and whisk again to combine, working out any lumps. Create a well in the center of the dry ingredients and add the butter, shortening, egg and egg yolk, and vanilla, mixing well after each addition. The dough will be soft but will hold its shape when scooped. Add the miniature chocolate chips and cornstarch to the cookie dough, and mix until the chips are evenly distributed throughout. Prepare and bake the cookies. Drop the dough by the heaping tablespoon on the prepared baking sheets, leaving about 2 inches from one to the next as they will spread during baking. With wet fingers, press down evenly on each tablespoon of soft dough to make a disk, smoothing to ensure a circular shape. Place the first baking sheet in the center of the preheated oven and bake, rotating once, for 8 minutes or until very lightly golden brown all over. Allow to cool on the baking sheet until firm, about 5 minutes. Transfer to a wire rack to cool completely. Repeat with the remaining baking sheets, one at a time. Match the cooled cookies into pairs and place them in the refrigerator to chill. Assemble the ice cream sandwiches. If using homemade ice cream, remove the wrapped cylinder from the freezer. Working quickly so the ice cream doesn’t melt, place the ice cream on a flat surface and unwrap the cylinder. Using a large, sharp knife, slice cross-sections of the cylinder into 10 equal pieces. If using store-bought pints of ice cream, slice through the paper pint container with a large serrated knife in cross-section to create approximately 1-inch thick disks. Remove the cookies from the refrigerator, invert one cookie of each pair. Using a spatula, carefully place one piece of ice cream on top of the overturned cookie. Place the other cookie of each pair on top and press to sandwich. (If you used store-bought ice cream pints, peel the paper from the ice cream.) Press the miniature chocolate chips onto the exposed ice cream all along the edge of the sandwich. Wrap the sandwiches in plastic wrap or unbleached parchment paper and place in the freezer until ready to serve. P.S. If you haven’t yet, please pick up your copy of Gluten Free Classic Snacks. Without your support, I’d be lost! These look amazing! I have already pinned this recipe and CAN NOT wait to try it out! I already know that I will love these. Thank you once again for another wonderful GF treat! Wait, they don’t make these anymore? I didn’t notice either but there’s loads of things I didn’t notice. Apparently Oreos have really branched off from regular and double stuffed. This is the epitome of perfect ice cream snack. I LOVE chipwiches and always were a favorite as a kid. Thanks! Are chocolate chips something I need to buy Gluten free?? And I was under the impression that cornstarch was a no-no….? These look amazing!!! Most of the Nestle (they are labelled gluten free on the back near the ingredients list) and Hershey’s (their website has a gluten free list updated regularly) baking chips are gluten free. As for corn starch, there can be cross-contamination issues depending on the manufacturer’s practices. Argo brand is labelled gluten free. I’m baking a birthday cake this evening but I think these would be lovely too! Have a wonderful long weekend, Lucy! I feel like this is going to be my go-to dessert recipe this summer! Thanks for sharing, I can’t wait to try them!